There are many different fasting regimens. Let’s be very clear to start, though. There is simply no ‘best’ one. They all work to different degrees for different people. Just as some people prefer steak to chicken, there is no right or wrong answer. One regimen will work for one person but be utterly ineffective in the next. Fasting is defined as the voluntary act of withholding food for a specific period of time. Non-caloric drinks such as water and tea are permitted. An absolute fast refers to the withholding of both food and drink. This may be done for religious purposes, such as during Ramadan in the Muslim tradition, but is not generally recommended for health purposes because of the accompanying dehydration. In our IDM program, we do not ever use the absolute fast. Fasting has no standard duration. Fasts can range from twelve hours to three months or more. You can fast once a week or once a month or once a year. Intermittent fasting involves fasting for shorter periods of time on a regular basis. Shorter fasts are generally done more frequently. Longer fasts are typically twenty-four to thirty-six hours, done two to three times per week. Prolonged fasting may range from one week to one month. I categorized fasting periods with a break point at 24 hours, although this is somewhat arbitrary. In my experience in the IDM program, I generally use shorter regimens for those who are mostly interested in losing weight without much in the way of type 2 diabetes, fatty liver or other metabolic diseases. For those who have more significant illnesses, I use longer duration regimens as they tend to give faster results. After the initial ‘breaking’ in period, we always work with the patients to find out what they prefer to do. A surprising number of patients prefer longer duration fasts less frequently. 1. 12 hour fasting – There are several regimens of fasting that use a shorter period of fasting but done every day. A 12 hour fasting period done every day used to be ‘normal’. That is, you would eat 3 meals a day from, say 7 am to 7 pm and refrain from eating anything from 7 pm to 7 am. At that point, you would ‘break your fast’ with a small breakfast. This was pretty standard in the 1950s and 1960s. There wasn’t much obesity back then. However, there were two major changes that happened since then. First was the change to a higher carbohydrate, lower fat diet. This tended to increase insulin. Second was the increase in meal frequency, as we detail in a previous post, which tended to reduce fasting periods. If you could eat unprocessed foods, avoid excessive added sugars, and did not have significant insulin resistance to start, this 12 hr daily fasting was probably good enough for most people to avoid obesity. However, it is not really strong enough to reverse decades of insulin resistance. 2. 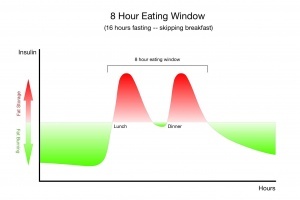 16 hour fasting – This regimen involves using a daily 16 hour period of fasting and an 8 hour ‘eating window’. For example, this would mean eating from 11 am – 7 pm, and fasting from 7 pm to 11am. This generally means skipping the morning meal every day. 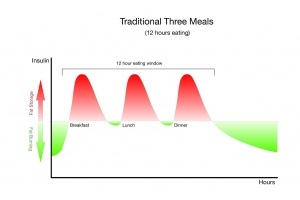 Some people choose to eat 2 meals during that 8 hour window and others will eat 3. This regimen was popularized by a bodybuilder by the name of Martin Berkhan who blogged about it on his website www.leangains.com, and so the method is sometimes called the LeanGains method. He wrote extensively in the years 2007-2010 but I don’t see much activity on his blog anymore, which is a real shame, because he had some great ideas and original thought. There are still some excellent posts there. He wrote extensively about training in the fasted state and eating predominantly in the post-workout period. These ideas are supported by the science available (albeit not a lot). However, they do make a lot of common sense. Several years later, an editor at Men’s Health wrote a book called The 8 hour diet, which essentially used the same 8 hour eating window as the LeanGains method. In his entire book, he strenuously avoided any mention of LeanGains or Berkhans, even though this method transparently ripped-off LeanGains. You can’t really patent a time period of fasting, but the intellectual dishonestly was appalling, regardless. It is like writing about E=MC2 and never mentioning Albert Einstein, but instead pretending to have ‘discovered’ it yourself. 3. 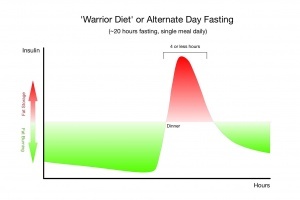 The ‘Warrior’ diet – This was one of the first diets to popularize intermittent fasting regimens. Written by Ori Hofmekler in 2002, this diet stressed that timing of meals mattered almost as much as composition of meals. In other words, ‘when you eat makes what you eat important’. Actually, I think both are important, but the ‘when’ question is seriously under-appreciated, and this book was one of the first to really point this out. Drawing upon inspiration from ancient warrior tribes such as the Spartans and Romans, the core of the diet consists of eating all meals in the evening during a 4 hour window. The fasting period of 20 hours consisted of most of the day. There was also an emphasis on natural unprocessed foods and high intensity training. The main point of all these fasting regimens is the same. It allows the body to lower insulin levels very low for a specified period of time longer than usual. This is precisely what helps to break, or prevent the development of insulin resistance. As we’ve mentioned previously, this is the fundamental biologic principle of homeostasis. The body likes to maintain everything within a relatively narrow range. Any prolonged stimulus leads to resistance as the body tries to resist the change. In this case, prolonged periods of high insulin will lead to insulin resistance, which will lead back to high insulin levels – in other words, insulin causes insulin resistance. So, by incorporating daily, or almost daily periods of low insulin, we are able to prevent the development of insulin resistance and even reverse relatively minor levels of resistance. For more established resistance, we would need longer fasting periods – 24 hours or greater. One of the key advantages of fasting, from a therapeutic standpoint is the lack of upper limit. What this means is that we can continue to apply fasting in an almost unlimited manner with no upper ceiling. The world record for fasting was 382 days, during which the patient suffered no ill effects. Fasting, similarly has no ceiling, which offers much more therapeutic flexibility. In other words, if I can keep applying fasting until I see the desired effect. The dose can go up indefinitely. If you don’t eat, will you lose weight? Of course. So there is almost no question of efficacy. It is only a question of safety and compliance. So for more complicated or serious cases, we can simply increase the dose. We will consider these longer regimens in the next post. A big thank you to my friend Dr. Ted Naiman who created these graphs. What? Fasting is NOT crazy, batsh@* stupid? Or like writing about E=MC^2 and never mentioning James Clerk Maxwell. Ha Ha Victoria- Beat me to the punch! Warrior diet looks really good- and is what I have gravitated towards. Hofmekler quotes Edgar Cayce on nutrition, which is rather odd, to say the least. Maxwell’s equations do not include e=mc**2, which was discovered by Einstein later, in 1905. Maxwell was dead by then. Just saying. Thank you Dr. Fung, very useful information. I have read that fasting can increase serum uric acid concentration, as a byproduct of increased cellular degradation. Have you seen this in practice amongst patients with preexisting hyperuricemia? Yes, there is at least one study that shows this effect, and it may be due to mild volume depletion. While the uric acid may increase, I have not seen an increase in gout, although this is only my personal experience and can’t say for sure that it will not happen. Thank you so much, Dr. Fung, for this invaluable information & for your whole blog!!!!!! It is revolutionary & precious information!!!!!!!! Dr. Fung, one of these days you should tell how you came to doubt the standard mainstream diagnosis and treatments for diabetes; how you found out about high blood glucose being a symptom of insulin resistance, and not “diabetes”; and how fasting came into the picture as a treatment. Maybe this will be part of your upcoming book. From what I remember about the “Warrior Diet,” I thought the under-eating phase might have contained eating that would not comply with an actual fast. I like the 20:4 timing though, have found that not to be a problem. I am curious and will have to find my materials on the “Warrior Diet” and see how it fits in with my current thinking, it’s been about a year since I read his book. Does anyone else have an opinion, observation? Many people notice less reflux, for sure. I haven’t heard much about tongue coating, but my guess is, as yours, that autophagy is being activated. Thank you Jason Fung for this great blog & lectures. People who are insulin resistant and suffers from depression, anxiety and/or fibromyalgia, will their metabolism require a longer period to adapt to a LCHF diet and a fasting regimen? Should they espect initial worsening of mood, agitation and/or pain? Or should they stay away from LCHF and fasting? The effect on depression and anxiety is variable. Some feel better, others not. I have not found it to be particularly useful in fibromyalgia. There is still no reason to avoid LCHF. I have been doing LCHF and intermittent fasting for 2 years now. I am in nutritional ketosis most of the time. I was of normal weight but suffered from what was diagnosed as fibromyalgia after contracting the Parvo virus for 16 years. I am symptom free since I adopted this lifestyle. I do full body resistance training 3 times a week, run sprints once a week and do a steady state cardio workout once a week as well. I am 52 and female. I would definitely give it a good try. Correction: I meant, “inflammation is important for understanding depression,” of course, not for “treating” depression. Reducing systemic inflammation is likely to be an important part of treating depression. Dr. Fung – Thank you for this excellent series. I try to fast 12-16 hours daily; however, I usually have a couple of cups of coffee with cream each morning. Will the coffee with cream reduce or negate the positive effects of fasting? In other words, does the small amount of fat calories in the cream break the fast? I hope you’ll forgive me for offering this link. I don’t mean that Dr. Fung shouldn’t weigh in if he’s so inclined! However, here are some published fasting guidelines Dr. Fung has, and you’ll see, he allows cream in coffee even when fasting, up to a limit. Also, if you use the site search feature at the top right of this page and search for “beverages”, he has a post about beverages generally (although that doesn’t refer to beverages when fasting as such; the guidelines do). Thank you Cristoph; this is helpful. My understanding is that fat intake has little to no effect on insulin secretion but I was wondering whether this intake of energy from fat could reduce the benefits of fasting. My interest in fasting is to lose some excess belly fat. Cheers! My guess is sure, it probably does, a little bit. However, if it’s still mainly beneficial and the cream in your coffee makes it easier for you to fast, than that little bit of less effectiveness is probably worth it. Alternatively, if you can fast for 16 hours without coffee and cream, but 24 hours with, then I’d say the “with’ is also clearly more effective. Hi Marie – The current release date is Jan 2016 by Greystone Books. I’ve finished my draft and its in the editors hands now. Great! I always find it more helpful having things clearly outlined in a book. I take it you will discuss fasting in your book. I was wondering will you also be discussing the appropriate diet that a person is to follow once he has completed the fast? I am wondering on your thoughts on bulletproof coffee (butter + coconut oil + coffee) in the morning instead of breakfast. Specifically, i am wondering if this would have an impact on autophagy? i.e. would the small amount of protein in butter / high calories downregulate autophagy? Should i just fast with coffee and maybe some coconut oil (as per the perfect health diet). Hi Jason, I would want to join IDM program. Before doing so I want to now if you are for a vegan diet or LCHF (mostly meat and fats) diet after coming out of fast. Hi Jason, I would want to join IDM program. Before doing so I want to Know if you are for a vegan diet or LCHF (mostly meat and fats) diet after coming out of fast. I am T2 diabetic since 2004, and on LCHF diet since 2012. A1c maintained between 6.1 to 6.8. Canadian Diabetes Association standard diet was/is a disaster for me. Dr. Fung – I can’t wait for your book to come out! I’ve only been following your protocol since May 15th, but am already reaping benefits from it. I’m down over 13 pounds, and have been taken off of one (of two) high blood pressure medication. I’ve been fasting for 36-38 hours every other day and feel fantastic! Thank you so much! Do you have any opinion on magnesium supplementation to improve blood sugars/insulin resistance? I have been following LCHF for a long time and recently began gaining weight. I have been suffering with stress, lack of sleep, increased craving for carbs etc. After researching what might be causing this I stumbled on magnesium deficiency and have been supplementing for the last few days. The main thing I notice is a lowering of hunger. Maybe a future blog post? I would love to know your thoughts on the mechanism of magnesium in the body. Magnesium is the one supplement that we use the most. We often test serum magnesium levels and they are often low in diabetic patients. Also, many people complain of constipation and cramping which can often be helped by magnesium supplements. Whether it lowers blood sugar is debatable. Dr Fung do you also find the same issue with magnesium with obese but non diabetic patients? You haven’t shared any thoughts on the subject of women and if we benefit or not from IF. I’d be most greatful if you would! From my experience, I have noticed no difference in effect between men and women. I apologize if you have answered this elsewhere, but I’m wondering what your thoughts are on fasting and adrenal fatigue? I’m a LCHF marathon runner and have had issues with adrenal fatigue in the past, but am intrigued with the idea of daily fasting. Thanks! I don’t think fasting causes adrenal fatigue. Is it safe for a person who does have adrenal insuffiency and is taking corticosteroids to fast? Are there any medical conditions where it is not safe for a person to fast? If you don’t feel well for any reason during fasting, you should stop immediately. Certain medications may cause problems during fasting. Adrenal insufficiency and steroid use is not a contraindication. Does missing meals/fasting cause stomach ulcers? That is one argument people have told me whenever I tried to skip my meals. I am interested in following the Leangains protocol in which i fast for 16 hours and workout 3 times a week. I was wondering if eating a high carb diet such as 40p/40c/20f would still be ok since i am fasting for the majority of my day to keep my insulin sensitivity high? Thanks Marie.. Those links are helpful. I’m also a big lover of missing breakfast in spite of what people around me advice… Though recently I happened to try the 24 hours fast that Dr Fung recommends… I like it a lot as I feel much more alert and am able to concentrate more on work. In fact, I prefer the 24 hrs fasting days than the normal eating days. Thank you so much for sharing this with me! Just yesterday, my husband came home with an Indian cookbook. He said that he thought that I could eat this and be faithful to my diet. I made him read all the ingredients to me. I was surprised that everything was on the LCHF diet. My husband loves to cook and is frustrated that I just want to eat simple food. The Indian dish that he made for dinner was delish! I will look closer at his cookbook to find new recipes. Wondering this as well. Also, read [here](https://idmprogram.com/wp-content/uploads/2014/06/Fasting-Guidelines.pdf) that coconut oil is limited to 1 T. per cup, but is that only for coconut oil or all 3 of the above bullets (Milk, Cream, Coconut Oil)? my last blood test is 8.6(no fasting), HA1Cis8.9, I am taking insulin. I am not sure if fasting is work for me. Well, Liane, you haven’t given any details of what you’re doing in terms of fasting, diet, etc; how long you’ve been doing it; what else you’re doing; when these tests were done; when and what your previous tests were; etc. I’m not saying it is working for you. I’m asking, what informed comment can be made just based on what you’ve written? When I did the blood test in April, I am taking three meals like normal people but I try my best to eat healthy. I also start taking meffumin two tablets twice a day. The medicine make me uncomfortable. Now I have to start using insulin at bedtime everyday. I check by my meter. Fasting around 6.6, after meals 2 hours around 10. I only eat vegetable, fruits and proteins. Great work here!! Have you noticed any link between any of the fasting regimes and issues with gallstones? I understand that long bouts of not eating contribute to bile build-up in the gallbladder and the potential creation of gallstones. I’d be interested in hearing about your observations and what studies may say to reduce the chance of this happening. Please keep up your great work! For someone with kidney disease from diabetes, do one have to also avoid fats which are high in potassium and phosphorous? will kidney disease be an ongoing issue even when sugars are under control from the change diet and intermittent fasting? Dr. Jason Fung: The kidney disease is not easily reversed, even though the diabetes itself can often be reversed. The damage is usually already done. Hi there, just finished reading this series…what an abundance of good information! I’ve been doing IF for about 3 weeks now, mostly the 16-8. I’m an endurance athlete and am currently around 6% body fat. I feel great on this schedule of eating but was wondering what is the longest fast you might recommend. My main goals have to become better fat adapted in order to reduce my caloric needs in races/be able to maintain a high intensity while burning a high percentage of fat. Any advice would be great, thanks! I love your website.I am vegan for a year now and have gained 10pounds, I am trying 16:8 intermittent fasting for 3 weeks and haven’t lost any weight. what is a good fasting insulin level? i want to check it with my next blood work. You’ve gained weight because veganism is an all-sugar diet. Try eating more meat. Have you read “Fasting and Eating for Health” by Joel Fuhrman? It’s a pretty scientific read on the subject and came out in 1998, long before any of these books mentioned. Because we are all individuals and react differently to foods and especially carbs, my advice is to use a glucometer. Eat one food at a time and change the size until the BG is in normal levels. Of course you have to be ready to eliminate some foods through this method. For example for me 6 cherries bring my BG to 200 for the next 3 hours and I need a fist of pills to bring it down – so I considered it is not worthy. can I have high insulin levels without insulin resistance ? since a little kid i was a little fat but my sugar levels is very low and I’m 35years with 30% bodyfat, sugar levels with 12 hours fasting is 80, I feel like I have hipoglicemic levels sometimes, when i eat carbs without fat ..
during the 16 hour fasting period would it be ok to drink kefir (water grains, with fruit juice used for secondary fermentation)? Nope. Fruit juice = sugar (no such thing as healthy sugar). Just drink water. I’m struggling with WHY in the intervals the body becomes fat burning; i.e. burning unwanted fat already stored. Won’t it attempt to use the stored glycogen and isn’t there sufficient for the 16 hours right there? I’m wondering if some inulin powder intake during fasting days is useful/advisable or it can somehow “break” the fasting. I’m very much interested in fasting to bring down insuline. Could eating only fat all day, in coffee and tea, have similar effect on insulin levels? I have been fasting for 10 says now and aiming for 14. Maybe more. I use water mainly. I have read that it could be quite a stress for the heart muscle doing longer fasts. Any comments regarding that? And I wonder if it’s safe doing some slow tempo bicycling during longer fast?